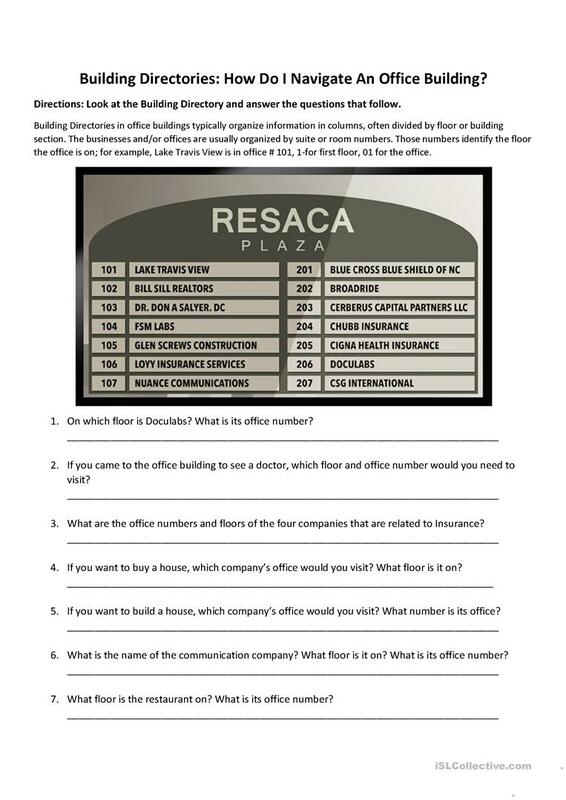 A worksheet to help a student learn how to use a building directory in an office building. The above downloadable teaching material was created for business/professional students, high school students and adults at Upper-intermediate (B2) level. It is valuable for consolidating Questions and short answers in English, and is useful for working on your class' Reading and Writing skills. It focuses on the vocabulary topic of Giving Directions. dorable7 is from/lives in United States and has been a member of iSLCollective since 2013-10-02 23:51:02. dorable7 last logged in on 2018-01-24 17:28:00, and has shared 4 resources on iSLCollective so far.